Ro-Brand Products now offers ClearPlus® brand Wiper Blades in sizes for most Domestic & European Applications. 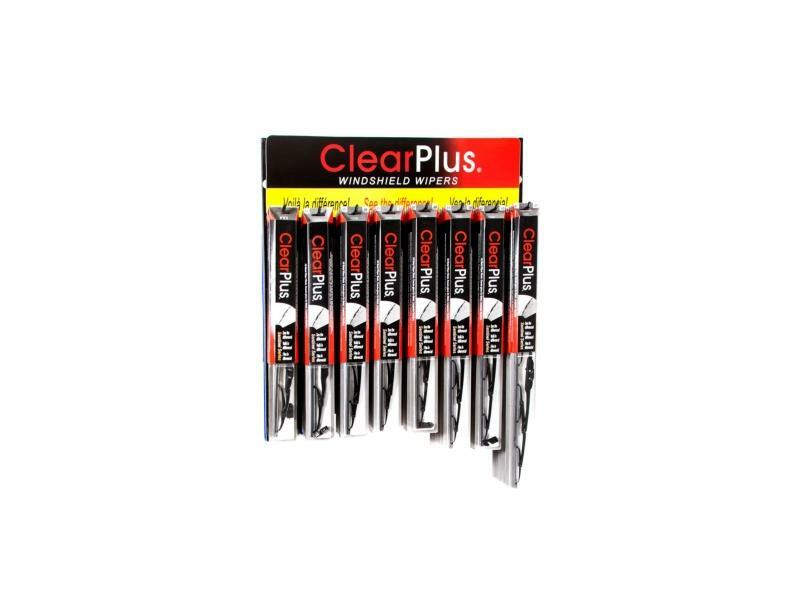 ClearPlus® wipers are designed with more pressure points than most other frame blades in the market. This allows better contact, pressure distribution and wrap around on highly curved windshields of today’s vehicles. ClearPlus Leading Edge® rubber technology uses highest grade all-natural rubber formulation, precision slitting and Molybdenum coating on rubber surfaces. - Provides quiet, chatter, streak and smear free wiping in both directions. - Provides resistance to splitting and tearing due to road and weather conditions. - All metal galvanized steel frame with embedded riveted hinges provides durability against rust and corrosion and safety in rough, stormy wiping conditions. - Meets or exceeds all safety and durability standards established by the Society of Automotive Engineers. - Universal adapter is pre-installed on the frame. Five each of the Eight most popular sizes and a durable wall mount rack to organize them.